Aeropostale is dying -- a victim of fast fashion and fickle teen tastes. The once-popular teen retailer is bleeding cash -- it's lost money 13-straight quarters -- and looks like it's lost the war to more nimble rivals like H&M (HMRZF), Zara and Forever 21. Aeropostale (ARO) reported another round of disastrous results, sending its stock plummeting 50% to a mere 20 cents on Friday. 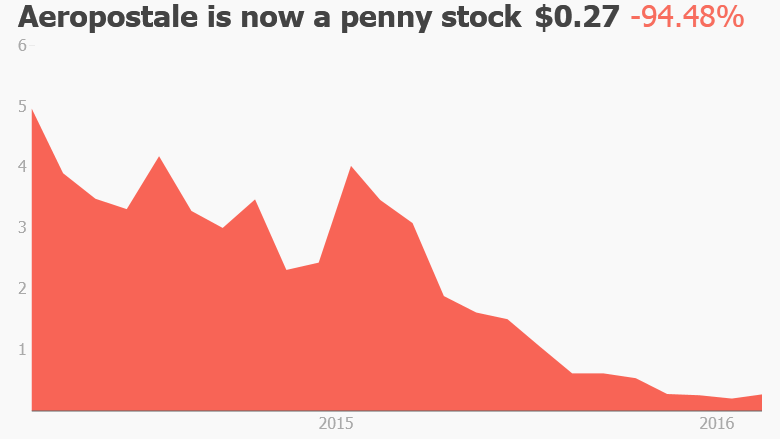 Aeropostale has now lost a stunning 95% of its value over the past two years alone. Now analysts are openly speculating about the eventual demise of the apparel brand. "Being the weakest player in a weak market is a very uncomfortable position...one that could yet lead to the eventual failure of the chain," Hakon Helgesen, a retail analyst at consultancy Conlumino, wrote in a report. Aeropostale has gone from struggling to stay relevant to struggling to stay alive. Sales declines have accelerated -- plummeting 16% in the three months ending January 30. Aeropostale was forced to resort to extremely heavy discounts, fueling a loss of $22 million. That's a lot amount of money to lose considering Wall Street now values the entire company at a mere $20 million. The latest results are likely to send Aeropostale in a "downward spiral," Helgesen wrote. Aeropostale, like other moderately-priced brands, is getting rocked by the fast fashion trend. 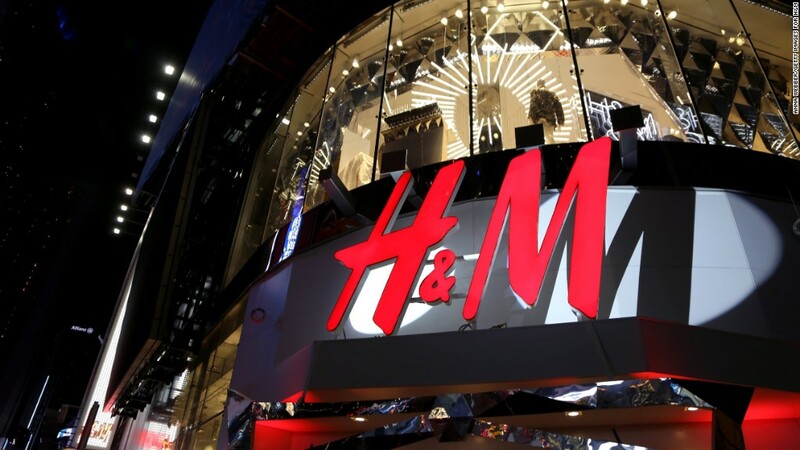 Stars like H&M, Zara and Forever 21 are responding to the latest fashion trends at warp speed, leaving older brands like Banana Republic and American Eagle (AEO)in the dust. They're also undercutting the older guys on price -- a critical factor for the target audience. Paula Rosenblum, managing partner at retail consultancy RSR Research said fast fashion's disruption of the retail industry has been "building for a decade -- but now it's hit a fevered pitch." "If I could get two of something for the same price of one at Aeropostale, why would I bother spending that money if I'm 16 years old?" Rosenblum said. Also analysts -- and likely customers -- believe Aeropostale's brand and stores feel tired. "While consumer tastes have shifted, Aero has steadfastly clung to a range that looks more at home in the mid-2000s than 2016, and a store environment that all too often resembles a yard sale," said Helgesen. Aeropostale's situation has been exacerbated by a fight with a key vendor of its apparel. Aeropostale said the dispute with MGF Sourcing is causing a supply "disruption." MGF, which is owned by Aeropostale lender and former investor Sycamore Partners, did not respond to a request for comment from CNNMoney. Responding to the crisis, Aeropostale shut another 13 stores last quarter and further slashed costs. However, Helgesen argues that will "do nothing to cure the underlying illness of a weak brand." Aeropostale announced plans on Thursday to explore "financial alternatives, including a potential sale or restructuring." Does that include weighing a bankruptcy filing? Aeropostale refused to answer that question when CNNMoney asked on Friday. And management declined to take questions from analysts during a conference call. But the clock is ticking on Aeropostale, which may struggle to find a buyer and now has just $65 million in cash, down by half from a year ago. "It is not clear who would want to buy Aero when it is in such a poor state," Helgesen said.